Blog Quick Quotes: Give Thanks with Neva! Hello friends of Quick Quotes, Neva here to share a three-dimensional Thanksgiving card. I used the lovely Autumn Brilliance collection to create this festive fall card. This card folds flat for mailing, and stands up and holds it shape by clever tabs and slits in the design of the card. I started with Autumn Brilliance 102 and 105 for the base sections of the card. Using a template I traced and cut out the sections. 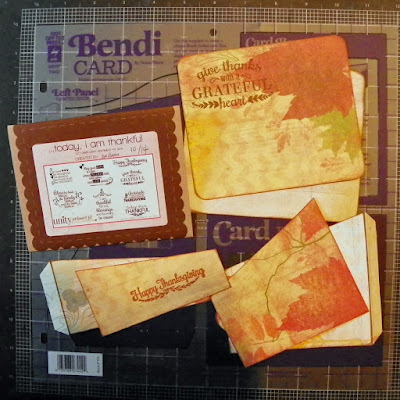 Autumn Brilliance 100 is used to create the front panels on each section of the card. I used parts of the design that would highlight the leaves and show the fun zig zag pattern. The edges are inked in Powder Puff Chalking Ink in Kokomo. Using a stamp positioner, the sentiments are stamped on the sections before assembly. This allowed me to stamp multiple layers of ink to create nice dark impressions without smudging. Three sets of the leaves are die cut from 100 and 102. Using ink daubers each type of leaf was inked in a variety of Powder Puff Chalking Ink Colors. 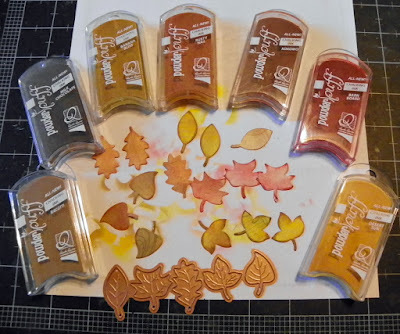 I used Barn Board, Desert Sun, Banana Bliss, Biscotti, Rusty Nail, Milk Chocolate, and Kokomo to create fall colored foliage. The card is assembled using strong adhesive and glue dots to hold the leaves in place. The leaves will stand out a bit from the card when it is in the displayed "bendi" position. This card was so much fun to assemble from the wonderful Autumn Brilliance collection. I think it is a fabulous autumn card to celebrate Thanksgiving! PowderPuff Chalking Inks: Milk Chocolate, Kokomo, Barn Board, Desert Sun, Banana Bliss, Biscotti, Rusty Nail. Thanks so much for stopping by and do enjoy your time with family and friends during this Thanksgiving holiday!